We’re calling ‘halt’ to this deadline-driven world and fast-paced lifestyle, and opting for a break. But since it’s not yet time for a decent holiday, a quick relax will have to do. Our location of choice? A sunny balcony that allows us to feel that luminous sensation on our faces, while lifting us high above the urbanites and treating us to some cityscape views. So, pull up a chair and cup of tea (or glass of wine, your choice), and let’s kick back a little with these 10 beautiful balconies. Which one would be perfect for you? 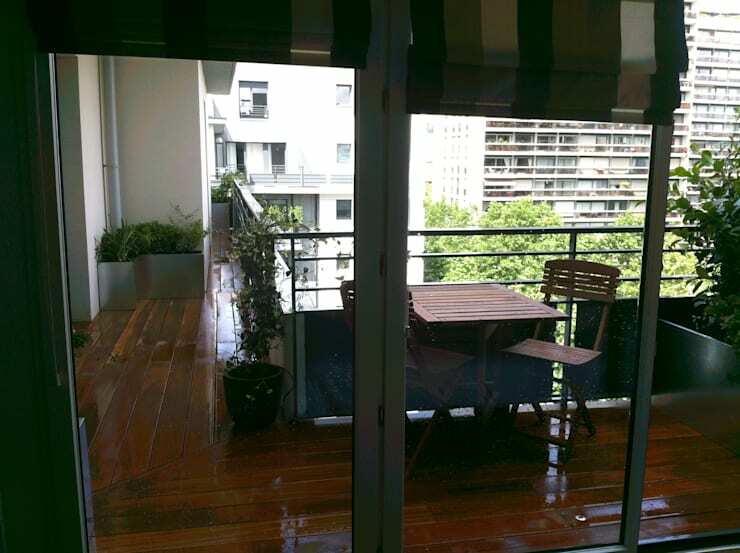 Of course one does want some accompanying greens to add a bit of freshness to that city-bound balcony. 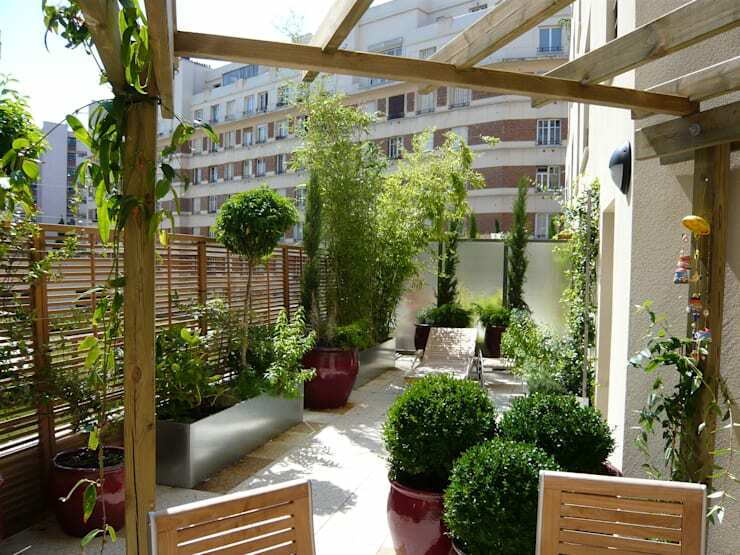 And this green oasis by Outdoor Scenes is just what the doctor ordered. Pressed for space? Then opt for this unique option to catch some sun high above the traffic. Curved iron rods conjure up a seating spot that is also a chic sculpture to jazz up that building facade. 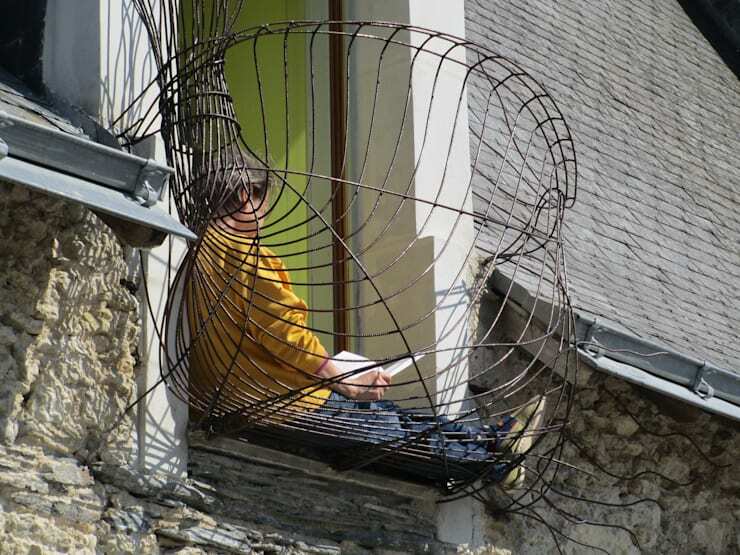 Add a pillow or two, and you have no excuse not to have a sit-down with a good book – except, maybe, if you suffer from a fear of heights. Got the space on your balcony? 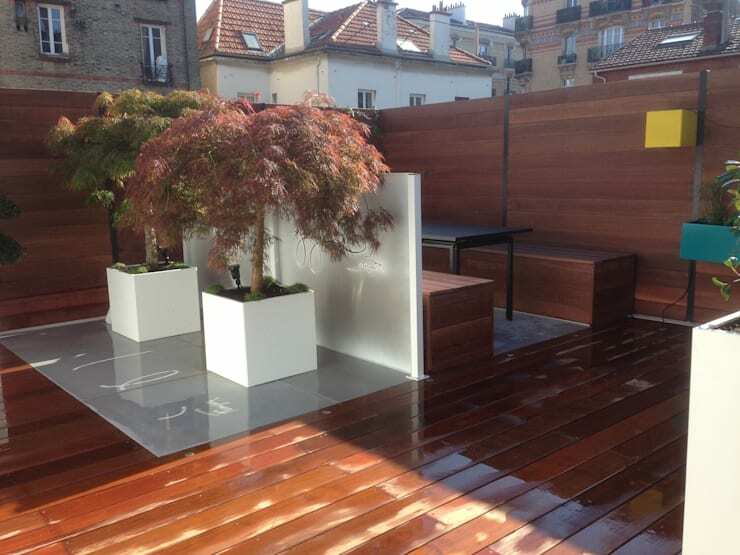 Then why not transform it into a unique little outdoor setting to enjoy some high-above-the-city meals? This balcony, which sports a unique combination of colonial- and Asian styles, is the perfect outdoor setting, as it offers more than adequate room for furniture and potted plants. And that beautiful, polished wooden floor… simply striking. 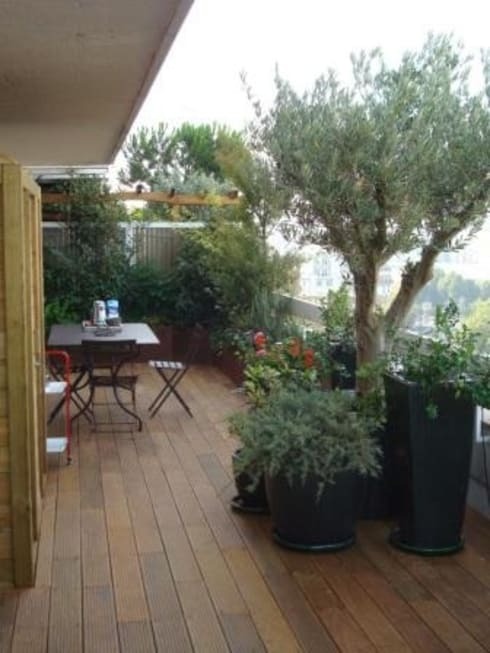 Taking a hint from our first example, this balcony also opts for a decadent little collection of plants and flowers to soften up its layout. 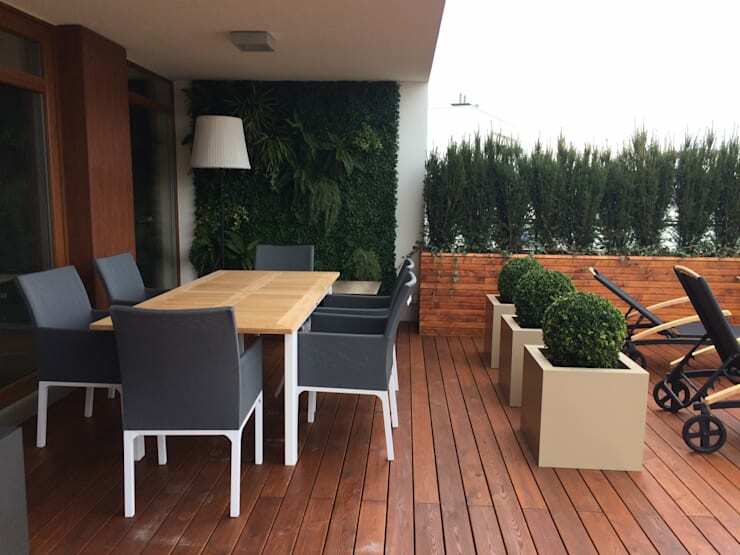 The right selection (and amount) of foliage is certain to transform any balcony into a relaxing oasis, as what could be more perfect than a bunch of plants and florals contrasting superbly with the surrounding urban landscape? Ah, the beauty of glass, allowing us some cover from the elements when we want to enjoy some exterior views, like in our example above. 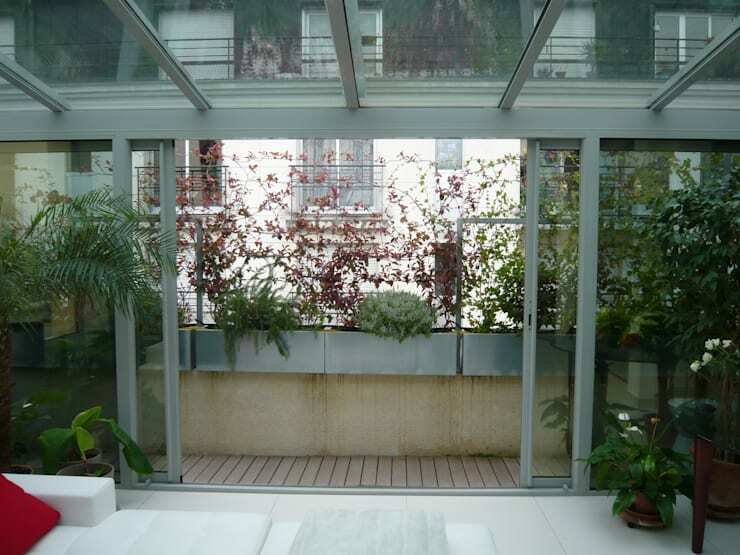 Mimicking a stylish conservatory or sunroom, this layout goes above and beyond your regular expectation of a balcony. Can you just imagine lounging on a sofa while watching raindrops drizzling down on that glass ceiling? No need to overdo it with your love for greens. 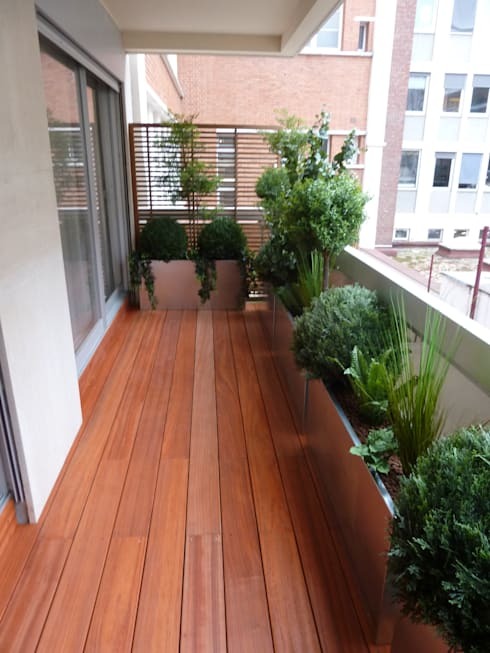 Here we have a very simple and straightforward look that still allows a fresh dose of vegetation to adorn that balcony space without having it become crowded. While chic potted plants embellish the balcony’s edges, there’s still more than enough room for walking, adding a furniture piece or two, and appreciating that amazing timber-panelled flooring. We just love that pergola! Added to this open balcony, it brings in a striking sense of completion and style, yet still allows for some charming sunshine to bask the balcony floor in a warm glow. Wouldn’t a fabulous lounge or sofa, complete with side table or two, just finish off this scene most terrifically? That open floor-plan on the balcony not working for you? By all means, add a divider. This modern space separator above neatly breaks up the balcony into different segments, making it crystal clear where we can dine, lounge, sunbathe, read, or do whatever it is we want to do on this modern beauty. Seeking some more greens in addition to your balcony’s potted plants? That’s the beauty of turf! 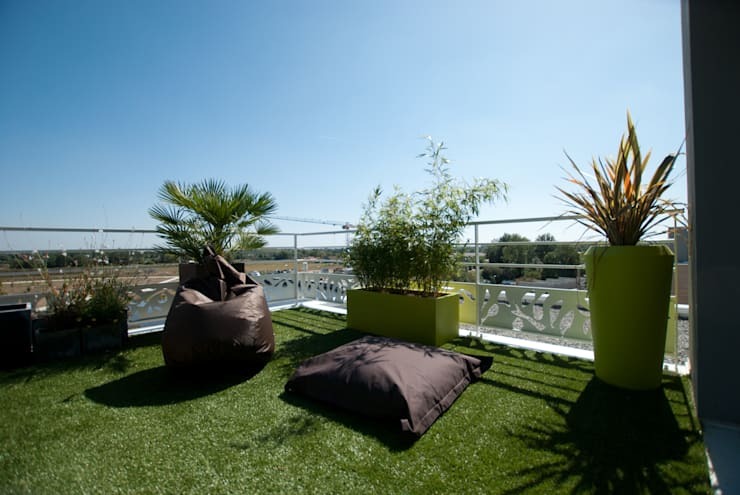 Just see the paradise effect that a nice patch of turf bring to this balcony space, where walking around barefoot is an absolute must. Add a pouf and plush pillow or two, and our relaxation levels are certain to soar! We close off our list with an option that is always a winner: the vertical garden. Saving floor space while adding a delicious dose of greens, the vertical garden is a tried-and-tested method for those of us who require lots of fresh foliage in our spaces. Now, to really rock our al fresco dinner party, we can just hang some decorative fairy lights from that wall garden, and watch it bask our balcony get-together in a magical ambience of charm and charisma. Considering your own vertical garden? Then have a look at: The benefits of a living wall. 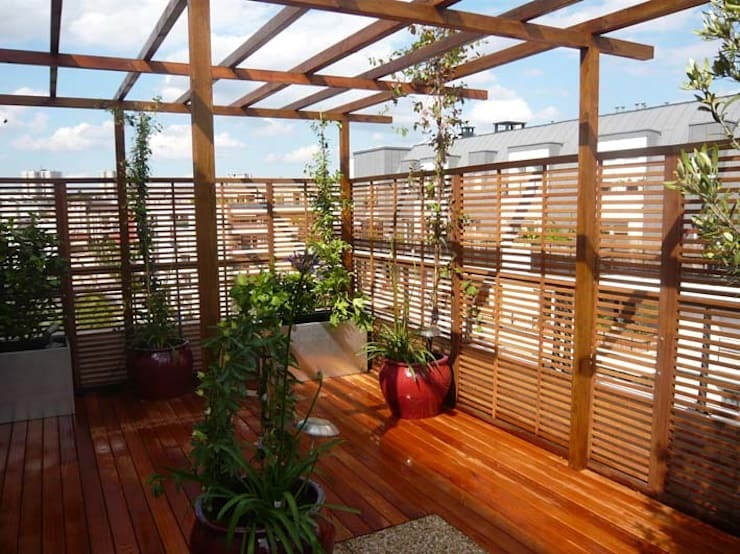 What other ideas can you think of to add some style to a balcony? Let us know in our comments space, below.